Reading over the memories section made me think of the times (early 60's) my Uncle and I (then a young boy of 13) decided to build a dock. We, my Aunt, Uncle and myself) would come to FC the last week in June to avoid the 2 week limit since we could then stay till July 14. At that time there was a clearing around site 170 where truck loads of pine slabwood from a sawmill in the area was dumped. I suspect the purpose was to give the campers firewood, but my uncle, being a very resourceful person, was able to build quite a dock from the slabs. I recall getting pine logs from the woods and pointing them with a axe, and driving them into the sand with a large rock. Needless to say it was a bit different from CampADK's present dock, but it served us well for the time we were there, and I suspect it also served the campers on that site the rest of the season. Years later (1982), I was there again, this time with my own young family. I located a sawmill in Onchiota, and purchased a $5 carload of slabwood. I then built my own replica of the same slabwood dock, using the big rock technique of post installation. Sadly, we learned of my Uncle's passing a week after we returned home, before I could relate my memory lane project. (Pete Stagg) who still hears the call of "Pies, Cakes, Cookies , Doughnuts, Bread, and Honeydips today" in his head. 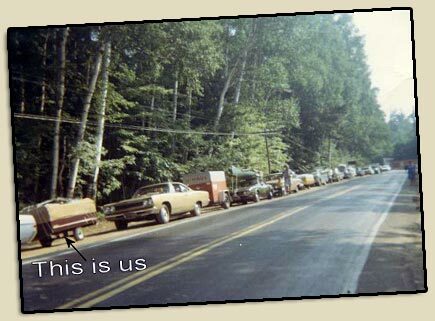 Do you or your relatives have recollections of the early days at Fish Creek? If so please email me dave@campadk.com. Any info as well as photos would be greatly appreciated!